The Archbishop of Winnipeg, His Grace Lawrence Huculak, who also fulfils the role of Metropolitan for all Canada, presided at the annual Pilgrimage at the Basilian Fathers’ Shrine at Mundare, Alberta on Sunday, June 25. Sts Peter and Paul Parish in Mundare has been holding the annual Praznyk Pilgrimage – popularly known by its Ukrainian term “Vidpust” - since 1911. It has always been a major event that includes a Divine Liturgy as well as a full banquet and concert. Always a very popular among the faithful, it has attracted as many as 2000 pilgrims making their way to the site to seek God’s grace and to express their gratitude to the Lord for His many blessings. It was in 1934 that the large “Golgotha Grotto” was built on a hill with a 55-foot cross raised above it. It was incorporated to serve as the 14th Station of a traditional Way of the Cross. Since the following year, 1935, the grotto has been at the heart of the annual pilgrimage and, unless the weather doesn’t permit, the hierarchical Divine Liturgy is celebrated here under the open sky as it was this year. This year the Pilgrimage attracted over 700 people. Metropolitan Lawrence was the main celebrant and guest of honour. He was joined by the Bishop of Edmonton, Most Rev. David Motiuk, Fr. Gabriel Haber – the Provincial Superior of the Basilian Fathers in Canada and many priests – both Basilian and Eparchial. 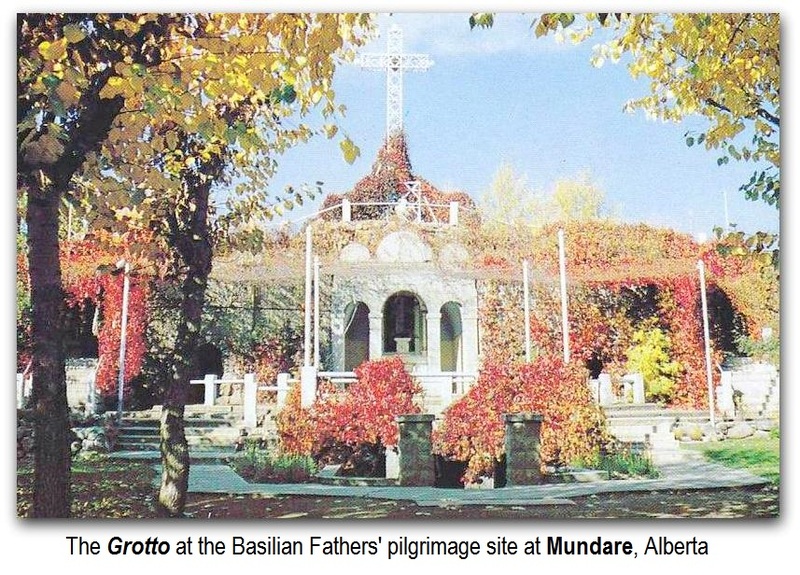 Besides the parish church and shrine, Mundare has served as a spiritual and mission centre for the Basilian Fathers since 1902. Since 1903 it also became an important starting place for the Canadian mission of the Congregation of the Sisters Servants of Mary Immaculate that, this year, is celebrating 125 years since its founding. Besides operating the parish, the Basilian Fathers have their monastery at this location as well as a printing press and Museum of Cultural and Religious Heritage. Mundare is also a place of formation for new candidates to the Order of Saint Basil the Great and the novitiate has been located in here. This year, the “Vidpust” pilgrimage to Mundare observed a number of special celebrations. The 150th anniversary celebration of the founding of the Dominion of Canada was well noted and the great contribution that Ukrainian Catholics have made to this country over the years – and the benefits that they received. Also the ongoing commemoration of 125 years since the first documented Ukrainian immigrants arrived in Canada to begin a new life. After initially living and working near the border town of Gretna in southern Manitoba, the first immigrant families moved to homesteads only about 45 minutes northwest of Mundare. Soon there were many Ukrainian towns and villages. The Basilian Fathers served them all throughout those pioneer years and up to this day. As Mundare is hosted by the Basilian Fathers it is natural that this year’s pilgrimage also commemorated the 400th Anniversary of the establishment of the Ukrainian Basilian Order as we know it today. Events celebrating this quadricentennial of the Basilian Fathers have been taking place around the world where the Basilians serve – including many of the eparchies across Canada. The June 25th Pilgrimage “Vidpust” was a bit of a homecoming for Metropolitan Lawrence. He is also a member of the Basilian Order, and would have visited Mundare on numerous occasions, although when he entered the Order, the novitiate program of initial formation was not situated in Mundare, but in Ottawa and, later, New York state. However, after he returned from successfully completing his doctorate in sacred Liturgy in Rome he served as the parish priest of Sts. Peter and Paul Parish in Mundare for over ten years, leading up to his being called to be the bishop of Edmonton in 1997.